Amazing chef and mother, Jill Redding, from Pianissamma, joins our blog group with an incredibly carrot recipe. Yes, you read that right. An. Incredible. Carrot. Recipe. When I was a child, I always looked forward to Sunday dinners at my grandmother’s house. Sunday dinners were always worthy of the good plates, especially after a good sermon at church. It wasn’t uncommon for some of those Sunday dinners to include a roast with potatoes, carrots, and onions. All cooked together in a Dutch oven. When I decided to become a vegetarian, I realized that I missed that idea of a one-pot meal. Sure, I use my slow cooker to make stews all the time. But to have root vegetables baked with a broth? I had yet to find a recipe that brought those veggies to life. So one Thanksgiving about ten years ago, I decided to make my own. This works well as a side dish. 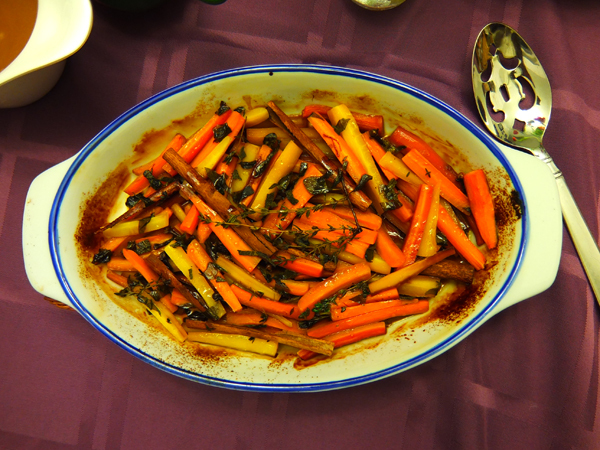 Spread carrots evenly in an 8-inch baking dish. Sprinkle cloves, thyme, basil and oregano on carrots. Take your cinnamon sticks, and break them in half lengthwise. Add cinnamon sticks to carrots, interspersed throughout the dish. Drizzle marinade over carrots. Cover with aluminum foil, and bake for 1 hour. Garnish with sprigs of thyme. Serves 4.